I never considered cheese-making to be an extension of cooking, but lately I've come to think of it that way. I read about Ricki Carroll in the memoir Animal, Vegetable, Miracle. The Cheese Queen, as she is called, has been teaching novices how to make cheese for over 30 years. I ordered some basic supplies from her website the New England Cheese Making Company and at the end of last week finally found time to try my hand at making homemade mozzarella. I came home from the gym at 7:30am, slung Merritt to my front, and dumped a gallon of organic whole milk into my stockpot. I was skeptical as I mixed in the citric acid but with some heat and agitation the whey started to separate from the curds! I let it sit for a few minutes, cut the curds, poured off the whey, added the rennet, heated and stirred it some more then scooped all the curds out of the pot and into a strainer. In another pot of hot water, I bathed the curds until they were warm enough to stretch (the fun part!) and pliable enough to mold into an imperfect ball. 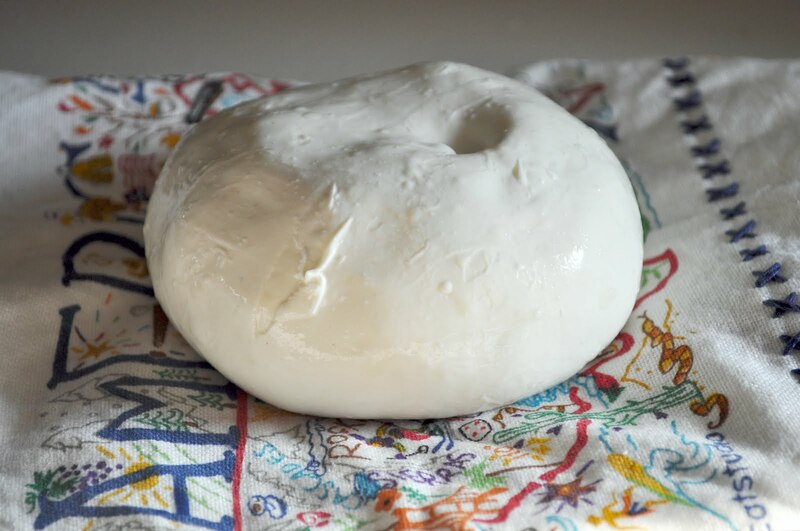 Mozzarella in 30 minutes! We cooled it in an ice bath, wrapped it up, and saved it for dinner. Our cheese had a flavor similar to store bought string cheese. Our first attempt was a success but, sadly, did not result in the tender milky mozzarella balls that we usually buy. The nuances of each batch can be manipulated at each step in the process, so I'll have to try it again. Ricotta cheese is another quick cheese to make, and would pair well with the boxes of farmer's market peaches and plums we have lying around in the kitchen. I use that same cheese making kit! You will never get the same taste and texture as the mozarella in the water you are used to buying because they use a whey starter. The bacteria in the starter give the cheese the taste/texture you are used to. But, it is still delicious and fun to make. Cool! It was really fun, and way easier than I ever thought. Yummy too! How did you hear about Ricki? Have you tried any other cheeses?